In 2009 our son Aaron was struck down with Guillain-Barre syndrome at the age of 19 being previously well and fit as youngsters are. Guillain-Barre (named after the French doctors who discovered it) is a relatively rare syndrome that anyone can get – approximately 1:100,000. Aaron had just got over a cold a couple of weeks before he started showing signs of weakness and tingling in his extremities – his hands and feet. He didn’t really mention this for a few days until we noticed him trying to pull himself up the stairs, using the handrail as his calves were now too weak for him to walk up the stairs unaided. Aaron had been to the gym the day before and thought that it was just fatigue so we weren’t overly concerned and laughed at the funny side of his efforts! Two days later Aaron could hardly walk and his arms were now feeling weaker – we called our GP and he told us to go to him straight away. After a short examination our doctor told us that he thinks that Aaron has a nervous system issue and pulled down one of his medical books to show us about Guillain-Barre syndrome which he believed he had contracted. Guillain-Barre syndrome is an autoimmune disorder. Everybody has the same chance of contracting it. It would usually start within weeks of recovering from a cold, flu or any other virus that needs your white blood cells to fight off. It seems that when the white blood cells have dispatched the virus they continue fighting and attacking the peripheral nervous system. Imagine the peripheral nervous system as a bunch of cables surrounded by a sheath; the white blood cells attack the sheath making electrical messages from the brain more difficult to reach the extremities hence the tingling and numbness in his feet and hands. The longer it goes on the further up the body the numbness and weakness travels, until it reaches the lungs, which can potentially be fatal. Our doctor called the hospital and I took him directly to the ward where a register was waiting for us. After a quick examination the register told us that he certainly believed that this was Guillain-Barre syndrome and that “he could well die!” Obviously that news was shattering and the whole family descended on the hospital. It was a frightening time. After lots of tests, lumber punctures, etc., Aaron was diagnosed and went to a high dependency unit. By now Aaron couldn’t walk at all and had very limited strength in his arms. The hospital put him on a course of immunoglobulin which is derived from donors’ white blood cells costing the NHS £100,000 for 1 week’s course! This is thought to help stop progression of the syndrome so recovery can start. After a week in hospital; Aaron was sent home to reduce chance of him contracting any hospital borne infections. He was still very ill and had lost a lot of weight. He had to use a wheelchair and was walking with the Zimmer frame and we had to take his bed downstairs. He remained like this for many months. Aaron started to get sensation back and had to learn to walk again, having physiotherapy 3 times a week at Medway Hospital for 2 months. I remember Samantha in tears watching him trying to stand unaided so that he could finally be signed off! Aaron is lucky to have fully recovered with no ongoing issues whereas many people who contract Guillain-Barre syndrome aren’t so fortunate. Some don’t make it at all and others can have dramatic life changing issues including partial or total paralysis. GAIN is the UK’s support and research charity for this devastating illness. The charity relies on fundraisers and donors, and receives no government funding. 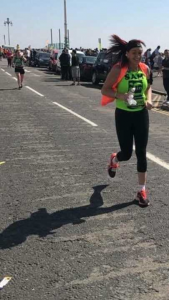 Samantha decided to run the Brighton Marathon in April 2017, raising £1,598.30 for GAIN, a charity which is close to our hearts.